Let the ceiling fan and lighting installation specialists from Bryant-Durham Services brighten your life with all types of residential and commercial lighting systems and ceiling fans. Durham, Raleigh and the surrounding areas all choose Bryant-Durham as the leading lighting systems service provider in the Triangle. We’ve been number one for more than 50 years and have no plans of going anywhere! Our business thrives on providing professionalism, value, quality and excellent customer service. Can include chandeliers, recessed lights, track lights, ceiling lights, wall mounted lights and even lanterns. Normally utilizes track, recessed or wall-mounted lights. And of course, the certified electricians at Bryant-Durham are seasoned experts at installing and repairing your exterior lighting systems as well. Our Raleigh and Durham electricians can also install ceiling fans. There are so many interesting, innovative new products available for your consideration today. Call one of our friendly representatives right away to discuss all of the bright options that awaits you! Contact us or call (919) 383-9227. You can find a ceiling fan in a huge variety of styles, colors and sizes to complement any décor. Ceiling fans reduce energy costs by recirculating cooler air in the summer months to help you feel up to 25% cooler and warmer air in the winter months. Your HVAC system has to work less, thereby saving you money. A ceiling fan costs only pennies per day to operate itself, even when used 24-hours-a-day. An outdoor ceiling fan not only helps you feel cooler, it also helps keep mosquitoes and other biting insects at bay, day and night. Many ceiling fans come with multiple light fixtures, giving you the option of more ample lighting in a room vs. a standard dome light. Need a ceiling fan or light installed in your Raleigh home? No problem! A ceiling fan installation specialist can save you the hassle of climbing ladders, decoding wiring instructions and trying to correct wobbly, unbalanced ceiling fans. From one ceiling fan to multiple ceiling fan installations in every room of the house, one call does it all—usually in one day! 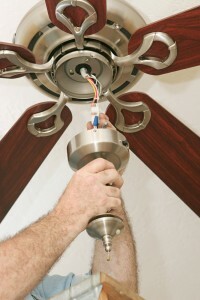 Have a friend or loved one who needs to have their ceiling fan installed but you don’t have the time to do it yourself? Let Bryant-Durham handle it for you! Whether it’s an elderly relative who’s unable to perform the climbing, wiring and lifting necessary, or a busy friend who simply doesn’t have the time themselves, we can perform the ceiling fan install and bill you directly! Contact us or call us today at (919) 383-9227 to schedule a professional ceiling fan installation!